• Constructor – A constructor returns a reference to the String function. • Length – Length property returns the length of the String. Prototype – A prototype property allows us to add properties and methods to an object. slice()– This method extracts a part of String and it returns a extracted part in a new string. This method uses two parameters the starting position and the ending position. substring() - This method is as same as the Slice Method, the only difference is that it does not accept negative indexes. In this output on clicking the button Microsoft will be replaced with Google. These Methods does not end up here, rather there are even more methods to manipulate the string. We are just covering most important and useful one. When we search any data in the text, we can use search pattern to describe what we are searching for. It is a sequence of characters that forms a search pattern. It can be a single character or more. Also, it can be used for performing all types of text search and text replace operations. Many a times regular expressions are used with String Methods and are search() and replace(). Regular Expression Modifiers: - Modifiers can be used to perform case-intensive matching. i = for performing case-intensive matching. g = for performing a global matching. m = for performing multiline matching. test() method is a regular expression method. This method searches a string for a pattern and returns True or False, it depends on the result. In this output on clicking the button we get this output “true”. This Method searches a string for a specified pattern, and returns the text found. If no match is found it returns the null. In this output on clicking the button we will get the following answer ‘e’. 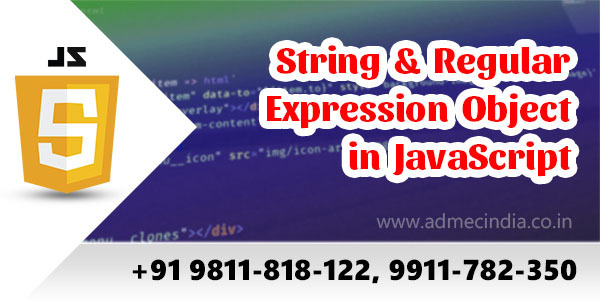 After going through the different methods of String Object and Regular Expression we can say these all these terms helps a lot in the programming a high-level UI and being a beginner, it is quite necessary to clear all the aspects carefully and then implement them in the script.